OVERLAND PARK, Kansas – June 30, 2015 – BLACKHAWK!® introduces four new SERPA® Holsters, including one for the new Glock 43 and three models to accommodate popular military and law enforcement duty pistols. BLACKHAWK! built these new holster models to meet the growing demand for carry options for slim-framed, personal protection pistols and additional full-size duty pistols. BLACKHAWK! remains dedicated to developing new models for customers who demand for the best carry options for concealable, self-defense firearms and duty pistols. By providing a secure retention holster built specifically to match these handguns, BLACKHAWK! 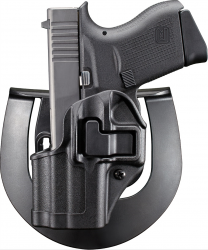 delivers reliable, secure holsters for a variety of carry options..